Our premium quality, handmade goat’s milk soap bars are famous throughout the northeast. Handcrafted in small batches for careful ingredient control, these wholesome, New Hampshire made soaps will delight you, your family and friends with their luscious lather, soft, creamy feel and lingering scents. Your skin will feel smooth and luxurious. Select from more than 25 popular scents! Enjoy colorful descriptions of each and every scent by clicking here. 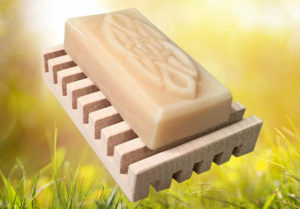 Our beautiful, New Hampshire-Made Retro Wooden Japanese Soap Dish.